Roll-up doors don't need to look intrusive or mechanical. 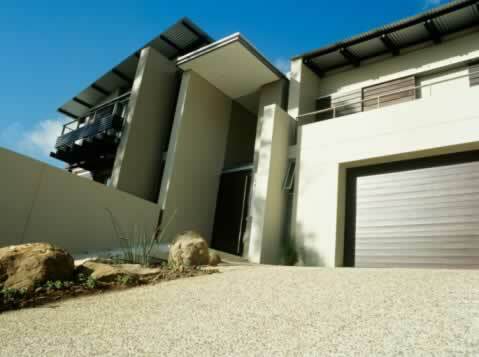 This roll-up door is colored to complement the color and design scheme of this modern home. The slats are tinted to match the louvered screens on the windows of the second story and the horizontal panels match the sharp lines of this attractive split-level home. With sectional roll-up doors, the hinged panels follow a track into your garage ceiling without requiring lots of room. You'll appreciate the range of color options available for roll-up door models in fiberglass, steel, aluminum, or wood. If you're on the go, you'll welcome the ease of operation. Depending on your climate, a roll-up door can keep temperatures comfortable inside your garage. Secure locking and alarm systems help protect your investment for years to come.